Our new Deluxe Eye Candy Stencil Set is an essential eye makeup and eyeliner set for any makeup enthusiast. Each deluxe set comes with one Eye Candy Gentle Adhesive Eyeliner Stencil Starter Pack, one Smokey Eye Stencil (also does a cut crease), one PRO Double-ended Shader & Smudge Brush and one Deluxe Pointed Eyeliner Brush. Create endless eyeliner and eye makeup looks with show stopping results! Our brand new Eye Candy Gentle Adhesive Eyeliner Stencils give you precise eyeliner in minutes and coupled with our original smokey eye stencil your eye makeup game just got a little hotter! All Beth Bender Beauty Eyeliner Stencils are made in Los Angeles, CA. Pro Tip: If this is the first time using our Eye Candy adhesive stencils, you can reduce the adhesiveness of your Eye Candy Eyeliner Stencils before applying to your eyelids by placing on your forearm first and then applying to your eye. Beth Bender Beauty Eye Candy Gentle Adhesive Eyeliner Stencils are multi-use, hands free and can be used up to 3 times per eyeliner sheet before discarding. • Create the perfect cut crease and smokey eye shape with professional results. • Get your favorite classic eyeliner looks like cat eyes and winged eyeliner in minutes. • Create seamless gradient, rainbow, mermaid, and unique eye makeup looks with ease. • The Eye Candy adhesive fabric allows you to use multiple makeup formuals to create your eye makeup looks. • Hands free design gives you the freedom to create popular eye makeup looks anywhere, anytime. Your Eye Candy Deluxe Set has everything you need for creating makeup artist savvy looks. Your Eye Candy Eyeliner Stencils will give you the perfect eyeliner, while your smokey eye stencil allows you to create a perfect cut crease and smokey eye shape. When used together this newest dynamic duo makes for one smokin' eye makeup and eyeliner look. For detailed instructions on how to use your Eye Candy Gentle Adhesive Eyeliner Stencils please check out our Eye Candy Starter Pack or Pro Pack page. 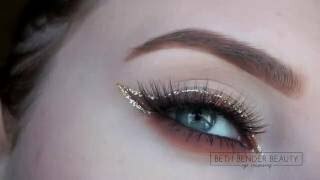 For video tutorials demonstrating our Eye Candy Eyeliner Stencils go to bethbenderbeauty.com/tutorials. All Beth Bender Beauty Eyeliner Stencils are made in the U.S.A.
For creating a smokey eye look place your smokey eye stencil securely over your eyelid holding it in place with your middle and index fingers. For a dramatic, smokey eye look that covers the entire eyelid area make sure your smokey eye stencil is snug along the crease of your eye before filling in with any color. For adding color to just the eyelid hold your smokey eye stencil slightly closer to your lash line. Fill in with color, remove smokey eye stencil and blend edges with an eyeshadow brush to soften any hard lines. Next it's time to create your cut crease using the rounded outer edge of your smokey eye stencil. 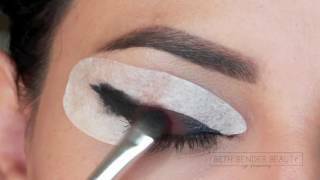 To create your cut crease place the rounded edge of your smokey eye stencil along the natural crease of your eye as seen above in image 1. Hold in place with your middle and index fingers and following the rounded curve of your smokey eye stencil apply your color starting from the outer eye and moving your brush in towards center of eyelid. 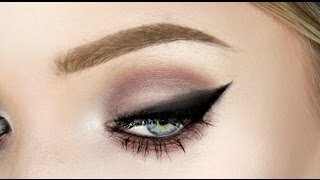 Use a contrasting color for your cut crease to enhance your eyes and create a more dramatic look. Begin softening your color as you get closer to your inner eye. Next it's time to create your eyeliner! Begin by removing the perforated piece located on your Eye Candy eyeliner stencil sheet as seen in image 1 below. Peel off one eyeliner stencil at the outer rounded edge and carefully place it over your eyelid. Your Eye Candy eyeliner stencil can be placed over your eyelid with your eye open or closed. 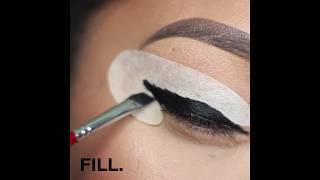 Place the top arm of your eyeliner stencil along the top of your eyelid and the bottom arm of your eyeliner stencil along your bottom lash line as seen in images 2 and 3. Both your top and bottom eyeliner stencil arms should lay flat against your eyelids. Repeat the same steps above for the other eye. For the best results your Eye Candy eyeliner stencils should be placed over both eyelids before adding your color. If you're using a powder eyeshadow it's important to tap off your brush to remove any excess color before applying your color. Begin at the tip/point of your eyeliner stencil as seen in image 4 and move your brush down towards the inner corner of your eye. Fill in the entire shape of your Eye Candy eyeliner stencil. As soon as you have filled in both of your eyeliner stencils, it's now time to peel them away and reveal your beautiful eyeliner! PRO TIPS: Our Eye Candy Gentle Adhesive Eyeliner Stencils are made from a hypoallergenic material that adheres to the eyes with ease and is simple to remove. They work on any eye shape or eye size and can be used with all eye makeup formulas. For a dramatic eyeliner look simply place the point/tip of your eyeliner stencil slightly higher on your eyelid. To create a classic eyeliner style, like a cat eye, position the point of your Eye Candy eyeliner stencil closer to your lash line. To prevent fall out when applying a powder shadow, make sure to tap off your eye makeup brush first before adding any color. 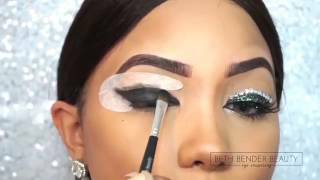 GRADIENT EYELINER: For a gradient eyeliner look as seen in our Eye Candy Eyeliner Stencil video's, swipe your brush or eyeliner applicator down the eyelid instead of across the eyelid using either an eyeshadow or an eyeliner. 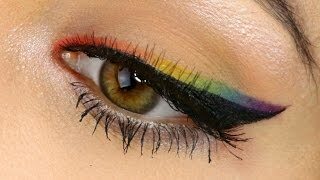 You can add as many colors as you like until your eyeliner stencil is totally filled in. POLKA DOTS: For creating a polka dot effect, start by placing your Eye Candy eyeliner stencils over your eyelids. For the best results apply a base color first to the entire eyeliner shape. Choose a color that is different then the shade you will be using to apply your polka dots. Next, using a liquid or a gel eyeliner in a contrasting color, start adding your dots. When you are satisfied with your dot appeal, peel away your eyeliner stencils and enjoy your fabulous eyeliner look! For a clean and hygienic makeup regimen we recommend NOT sharing your used adhesive eyeliner stencils. To protect your Eye Candy Gentle Adhesive Eyeliner Stencils keep them in the original packaging. This will also prevent exposure to heat and help give you the perfect application every time. Absolutely worth the purchase. If you're interested in creating classic and unique eyeliner looks effortlessly then this is the product for you. I use everyday and am so happy with the results. Literally Can Not Live Without! May I state that the absolute QUALITY of these products coupled with the affordability! I got these on a gamble and I hit the jackpot! The smokey eye stencil is very flexable, perfect thickness and very soft for the eye area, you get a cute black wiping cloth for your stencil. The adhesive liners are sooooooo soft! And pliable. You also get 3 glossy cards explaining everything in perfect detail. Now about the brushes. Beth? Could you PLEASE make a full face line? The brushes are matte black with the silver finishings, the bristles are soft and tapered PERFECTLY. All of these items fit neatly into a high quality taupe satin drawstring organza baggie. I WILL be buying more items, especially for my bestie!